A traditional hillside building with a blue gate in the village of Imerovigli is where you will find the staff of Petra Honeymoon Villas waiting on your arrival. Any questions about where to go and what to do are welcome. Once you have settled into your accommodation, you can enjoy an evening cocktail beside the pool bar and relish your first sunset on the magical island of Santorini. At Petra Honeymoon villas you will find a large swimming pool with whirlpool and a waterfall down to the children’s pool, a pool bar & sunbathing terraces with piped music everywhere. A BBQ area & traditional oven plus a a piano bar completion overlooking the swimming pool with incredible panoramic views. All accommodation has a spectacular view over the caldera to the volcano and the satellite islands of Santorini including views of three-quarters of the main island to Firostefani, Pyrgos, Kamari & Akrotiri. 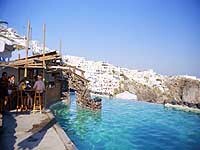 From the pool area you can also see the northernmost village of Oia and experience some of the most awe-inspiring sunsets in the world. In the rooms you will find a lounge area, A/C, private veranda, fully equipped kitchenette, mini fridge, coffee filter machine, direct-dial telephone, in-house music, hairdryer, CD player, safety box and private bathroom (shower or bath). 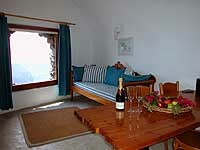 The rooms themselves are stylish but simplistic and above all extremely comfortable. Natural landscapes, tremendous views and idyllic scenery characterize the surroundings. tucked into the caldera, picturesque in outlook. In the rooms you will find a lounge area, A/C, private veranda, fully equipped kitchenette, mini fridge, direct-dial telephone, in-house music, hairdryer, CD player, safety box and private bathroom (shower or bath).